Our restaurant is a humble family run business with a charming and friendly atmosphere. 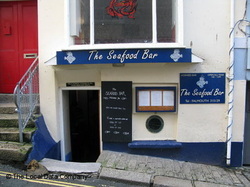 Kerry opened The Seafood Bar in 2006 which has fast become Falmouth's most loved venue for fresh and locally sourced seafood. Bouillabaisse. A seafood stew with white fish, mussels and prawns. All specials alternate frequently due to the source of fresh and local produce.